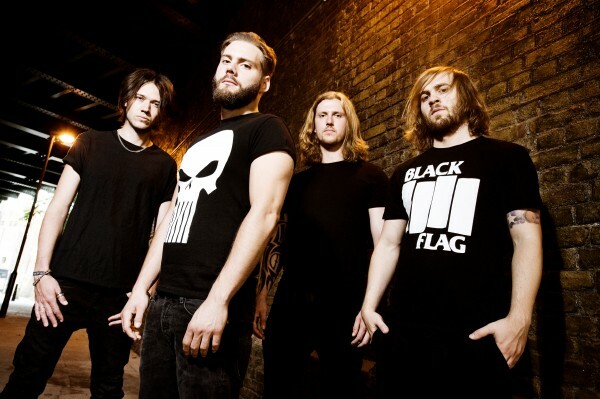 Diaries Of A Hero talk new album and plans for 2014. With the rise of new Metal from all corners of the Earth, it’s easy to become overwhelmed at times by the volume of bands that are actually out there. Of course, with this comes the task of separating the good from the bad, and that, in it’s own right, is a laborious task. But every now and again, a band comes along that fits the bill in the hope of carrying the flame forward for Metal. 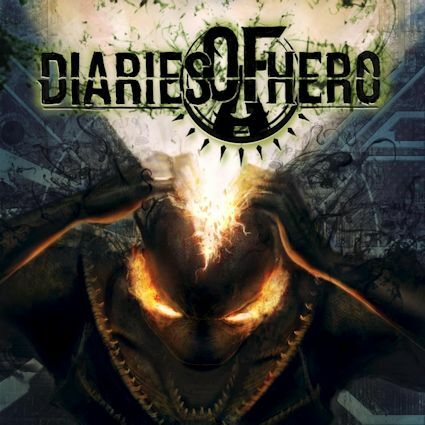 In this case, Diaries Of A Hero hit our radar and when we had the chance to find out more about this UK band, we took it. Overdrive caught up with bassists Matteo Bevilaqua on the release day of their sophomore self titled album. 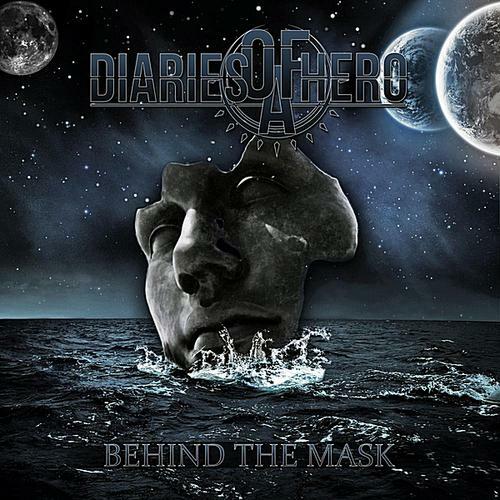 Welcomed by the critics as: “Energy and rage combined with technique to create an original artistic vision” (Rock Hard Magazine), Diaries Of A Hero released their self-titled second album “Diaries Of Hero” on 26th May 2014, via German label Dust On The Tracks. The record is now available. Their sound is characterised by an inner balance between clean and screaming vocals, solid rhythmic section and a perfect mix of sustained guitar lines, aggressive riffs and smooth solos. In 2012, on the back of their debut album “Behind The Mask“, the band toured with with Motörhead and Anthrax through the UK and Europe. The band also played at the Rock & Metal Circus Festival and at the Hard Rock Hell Festival, with the likes of The Quireboys, Wolf and Revoker. So not a bad list of achievements already clocked up for a band on their second release! 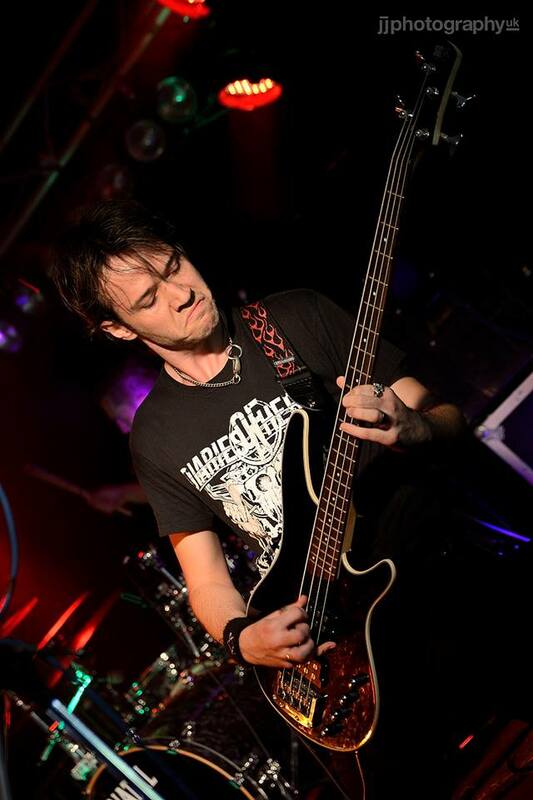 Bassist, Matteo gave Overdrive a slice of his day to discuss the bands plans now that the album is released. OD – How did you all meet? Matteo – We met in 2007 at The London Center of Contemporary Music. We were all attending the same classes and just bonded really well. We had a great opportunity to use the equipment, practice rooms and the recording facilities in the college and that’s where we actually pre-recorded the first few tracks which was great. It was one of those situations where we got the time to really get a feel for the music and each member of the band to become comfortable with each others style and ability. OD – Can you talk a little about the name of the band and how it came about? Matteo – There is nothing really special about who we got the name for the band. We actually had a different name back in 2010. We were called “Godsend” but found out that there was another band in Brazil with the same name, so we had to change the name. Carlo Del Favero (leading vocals and guitar) woke up in the middle of the night and the name “Diaries Of A Hero” popped into his head, so there was really no mystery or fantastic story as to how we got the name (laughs). OD – You formed in 2010 in London. Did you find it hard to gain any kind of exposure due to the large amount of bands that emerge from the city? Matteo – Absolutely! We actually hear that day after day from friends of ours who are in bands. People come from all over the world to seek their fortune in London and it seems that the bands that are actually getting more exposure, are the one’s that are coming from a smaller scene. I believe that there is a fantastic scene in Wales and also Leeds where the scene is smaller than it is in London. OD – Your debut album “Behind The Mask” was released in April of 2011 which then led to you supporting Motorhead and Anthrax during their UK & European tour, how did this come about and do you have any memories that stand out about that tour? Matteo – When we got the news, we were totally blown away. I mean, we had just played a gig in a bar in Camden and the next show was Brixton Academy! It was mind blowing! 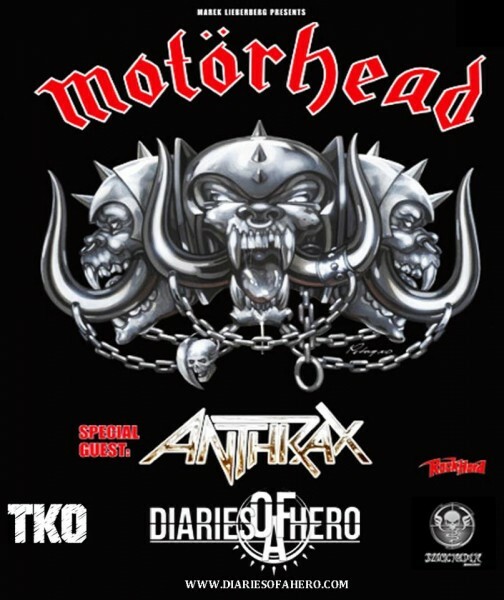 At the time we were working with our management who had good connections with the booking agent with Motorhead and Anthrax so we got an opportunity that we just couldn’t refuse. 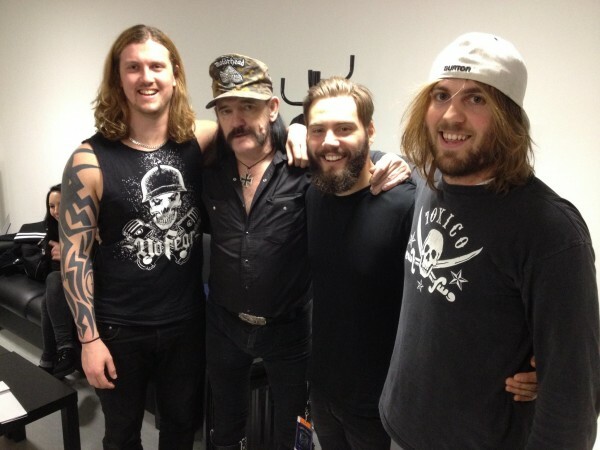 OD – Did you meet Lemmy or Scott Ian on that tour? Matteo – Yea, we met all the guys in the bands but two big memories from that tour would be, first, playing one of our best shows in the Zenith Arena in Paris, that was absolutely insane. We had never played in France and the crowd went totally nuts for us. I would have never imagined that the French would be like that, but they were chanting out songs and really involved with our performance. We were really welcomed and received so well beyond all of our expectations. The second memory was that we happened upon a funfair on a day off and ran into Phil from Motorhead and all the Motorhead crew. We ended up all having a go on the bumper cars. After is we were done, Phil came over to us and gave us all a hug and said “this is when touring is great, when we are in the venues we are the Emperor but here on the bumper car’s, we are all the same”! I just thought that it was so awesome. OD – The title of the new album is also the bands name? Why did you decide on this or was there any other titles that you were thinking? Matteo – On our first album, we felt that it was just four people trying to find our sound and identity. We all come from very different backgrounds around Europe and I think it was a bit of an experiment. When I listen to that album, I can tell in the progression of the songs that we were still trying to find what we really wanted to sound like. I’m very proud of it and really enjoyed that time, but this time around we are more focused and feel that we have really found our identity as a band. We approached this album with more of a clear identity of who we are and it almost feels like this really is the beginning of Diaries Of A Hero. OD – The new record is being released via “Dust on The Tracks” label in Germany, how was the transition from Red Pony to the current label and why? Matteo – The first label was an Italian label and the deal was not really good for us. They were all really fair to us and nothing bad happened to us. It was just not right for us and we managed to get out of that deal without any particular negative outcomes. We were out of a label for quite a long time and we were under management for some time and once we interrupted with that management company we got together with Dust On The Tracks and things have been great. I feel that we have a really strong team behind us now and we are all really excited about things. 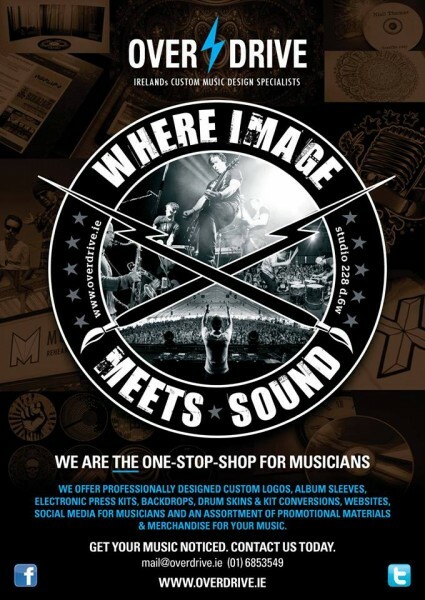 The label is a small one, but they have a distribution deal with SONY and work with some other bands that we know and they have done a fantastic job with not only them, but also with us at this point. It’s good to find people that we work well with and really look forward to the future with them. OD – . The new album is due for release on today (May 26th) which is just in time for the summer festival season. Do you have any dates that you can comment on at the moment for upcoming shows? Matteo – Not at the moment, as we have just been focusing on the release of the album and I guess the timing has not been great for us with regards to the Festival Season. We are planning to start touring extensively from October onwards. We were delayed with the release of the album and with regards to getting booked for the likes of Download or Sonisphere, we should have had a product out earlier in the year to gain a spot on one of the slots which are pretty much booked at this point. OD – The album was recorded in Croatia last year, can you comment of the reason for this location and how did it come about that Acle Kahney (TesseracT guitarist) was chosen to Master the album? Matteo – Our drummer, Leonard Berisha is Croatian and that’s the main reason of how it came about that we recorded over there. He had a contact over there who was a really great producer who had spent half a year living and working between Croatia and San Francisco. He he was learning his trade and purchasing new equipment for his own studio, which was a fantastic place to record. Another reason for the location of the album was that we had a few issues with the UK boarder as Leonard was not part of the European Union until July of of last year. He could only spend a few months over here (England) at a time and then he would have to go back. That’s one of the reasons why we have not gigged that much in the UK. We have done way more in Europe as a result of this. It was just more convenient for us to go to Croatia where we could record the album in a stress free environment. Regarding the involvement of Acle of TeseracT, it was pure luck really! I happened to meet his Uncle and he told me about his nephew and his band, so I went and checked them out and listened to “Altered State” and thought it was absolutely incredible, so I just gave Acle a call can he was a total gentleman and jumped at the chance to do the mastering of the album, which was a complete stroke of luck for us. OD – The video promo that you did for the new album is hilarious, who’s idea was it? Matteo – I can clearly say that any time there is a hilarious idea within Diaries Of A Hero, it usually come from Jonathan Weeks (guitars)! He lives for these kind of things (laughs). I think it’s important to not take each other to seriously. There needs to be that balance to make things work. OD – The second single from the album is now out, how did you find the decision to release singles before the album was due out, do you feel that it gave the album some good pre-promotion and would you recommend this for other bands? Matteo – Yes, completely! The last time we released the album and then the video came out ages after. It’s really important to have momentum with everything that we are doing. We coincided our single release with a launch party and or course the release of the album. It’s nice to have a lot of things going on and plenty to keep the press and potential fans busy. OD – Can you talk a little about the concept for the new video for J5? Matteo – Much like the concept of the album promo, we decided to have a comical element in the J5 video. It’s kind of half and half, as you can see we are in a studio giving it hell and the other side of the video is that we are in a grimy flat in Brixton just being disgusting (laughs). OD – Have you been writing since the recording of this album? Matteo – There is loads of material that we are working on at the moment. There are talks of a new EP in the Autumn, but that’s a work in progress, so there is not really any confirmation as of yet but it’s still a work in progress. It would be great to get to release some of the new material as soon as we can but we just have to wait and see. OD – What was the inspiration behind the cover artwork on the album? Matteo – From the early day’s we always had this idea that Diaries Of A Hero should follow a kind of Marvel Comics vibe. Actually, the artwork on the fist album “Behind The Mask” was meant to follow that concept also, however we ran into a little trouble with time and it turned out to be a sort of a panic, rushed job. It was not really capturing what we had in mind. With this album, we had a lot more time and approached it the way we really wanted it to look and reflect the music as much as possible. If you read the lyrics to “Shine Upon The Sun” on the first album, it’s about a super hero that becomes so self indulgent and egotistical about his importance and ability to “save the day” and becomes a villain/anti-hero himself. It’s about people who do more good for their own self gratification rather than actually “doing good” for the benefit of others. The idea of this creature that is both, hero and anti-hero. This was the concept of the new album and that’s where the idea came from. The design of the album was again, another stroke of good luck. We met Juan Blanco who did a fantastic job of creating the image on the cover. Juan happens to be my neighbor and it just turned out that he understood exactly what we were about and understood our vision. OD – What is your favorite album cover of all time? Matteo – For me it would be Megadeth, “Rust In Peace”. It’s such an iconic album cover and reminds me of my youth. OD – Can we expect to see some shows in Ireland any time soon? Matteo – We would love to play over there. I have never been to Ireland and really there is no excuse as to why I have not been there. We would love to get to play some show’s over there and am very interested in getting in contact with some of the promoters in Ireland. We are just ready to gig and would be very happy to gig anywhere that we can. Diaries Of A Hero – Diaries Of A Hero is out now, grab your copy here. Follow Diaries Of A Hero here.